I can't really blame Hip Hop for my "hangover" feeling today. I stayed up late with the hubs watching TV. Then I just couldn't get to sleep. Have I mentioned how GIGANTIC I am lately? Because I am. And it's impeding my sleep and I don't like it! Alright, more cards inspired by my sweet friends. This is my Kristen card. Sweet, extremely young, and amazingly talented Kristen. :) Something about a pink dress form reminds me of Kristen. 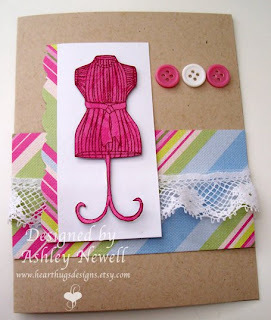 The lace I used on this card is a RAK I got from Kristen. Ok, so I don't have deep reasons why I made this card based on her. Sue me. It was my first one. 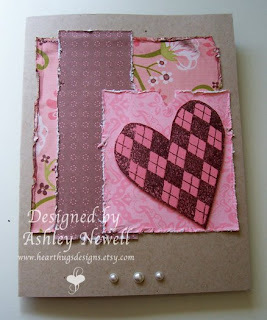 This card was also for the SCS sketch challenge this week. It uses Unity's April KOTM. This next card is my Jacquie card. I used Unity's Argyle Heart because as Kristen put it "Jacquie's heart is big and beautiful." Now, you have to see why I love my friends so much! They are so sweet and so dear! Jacquie likes to distress her cards and I rarely do so I pulled out my distressing tool just for her. Let me tell you, it did not want to cooperate with me! It was saying "you never distress patterned paper! What are you doing?" This is unique and pretty, that's what I was going for because that's what Jacquie is. Aww how sweet and I agree with everything you said about those two sweeties. Luv'em! Fab cards Ash! Very Pretty cards! Have a Happy Mother's Day! Very cute Ashley! You are so sweet! The cards are just fanatic and love the layouts and colors. Not to mention the fabulous stamps. I love these cards!! Yes this pink form reminds me completely of Kristen, and she IS sweet and cute!!! I love your distressing, you did a great job!! YOU are a sweetheart, I am so glad to have you as a friend!! This makes my whole year!!! HUGS and Happy mothers day!!! love ya! These are both very pretty Ashley! And you did a beautiful job with that distressing! Girl! You've been busy! These are beautiful as well! Great cards, Ashley! love how you challened those girls! TFS! Gorgeous cards, Ashley. Love the kraft! And I totally get you on the distressing...freaks me out every time I try to distress ANYTHING. WOW Ashley, these are all AMAZING! How do you find the time??? ?